Seniors David Thomas, Coby San Juan and Tyrek Warren all racked up double-digit points on Wednesday, propelling the Lake View High School men’s basketball team to a 48-47 win in a tightly contested clash against the Von Steuben Panthers. The experienced trio combined forces to score 40 points, including a floating jump shot by San Juan to give the Wildcats a narrow, 46-43 lead. Warren followed with a breakaway layup off a deep inbounds pass in the final minutes of the fourth quarter to seal the seesaw affair. The Wildcats are 3-0 at home after senior David Thomas scored a team-high 14 points on Wednesday (John Alfes/Medill). Thomas, a 6-foot-1 forward wearing the No. 0, spearheaded the offense by tallying a team-high 14 points. San Juan and Warren registered 13 points apiece, improving the Wildcats’ home record to 3-0 and overall record to 7-8. 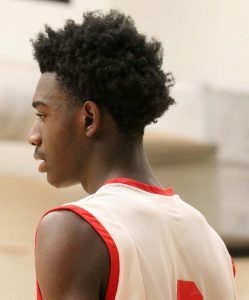 The momentum swung back in Von Steuben High’s favor prior to the fourth quarter, as home turnovers on one end of the court converted into visiting points on the other. The Panthers outscored Lake View in the third, 17-13, to take a 41-39 lead heading into the final, eight-minute period. Despite trailing by two points, Lake View stormed back and delivered with the game hanging in the balance. Davis employed double-teams on defense and assertiveness on offense, leaning on Thomas, San Juan and Warren to come through down the stretch. Thomas hoisted both of his arms in the air with three fingers raised on each hand at the inception of the fourth quarter, celebrating a three-point basket that helped his team regain the lead. That moment forced the Panthers to call a timeout. “We needed that, we really needed that three in order to be up,” Thomas said. San Juan found a crease in the Von Steuben defense with just over three minutes remaining. He crossed his dribble from the right side to the left before releasing the ball off one leg and swishing the net. “I started off slow, so it was great to finally make a big basket,” San Juan said. In the final two minutes of the fourth, Davis devised an inbounds play that was originally designed for Thomas. Instead, Warren broke loose and scored with no other player in front of him to give the Wildcats a five-point advantage. Senior Tyrek Warren scored the last basket for Lake View, a decisive layup with little time remaining in the fourth quarter (John Alfes/Medill). Four other Lake View players scored two points each. The Wildcats will return to competition on Friday against Schurz High School at 5 p.m. In the meantime, Davis and company will practice and look to build upon their recent success.